So Your Thinking Of Getting A Rabbit…..
Posted by Jon in Rabbit Care Information on Friday 17/06/2016 20:36 UTC. Rabbits can live up to 10 years! Can you commit to this? Rabbit's can make wonderful pets. They are as playful and loyal as a dog with the comical aspects of a cat - and let's face it they are adorable! Is a Rabbit For Me ? Yes, rabbits are cute little fluff balls with big ears and feet and little twitchy noses. But this is a live animal here and it is a big responsibility to keep! As mentioned previously, rabbits are seen as the ideal starting pet....I disagree. Out of all the commonly kept pets, rabbits are the hardest to look after. They do not make noises like a cat to tell you they are hungry, they do not whine like a dog when they are hurt. They need to be cleaned out frequently, played with daily and have a very strict diet. In fact, rabbits are classed as a exotic pet and you need to know a rabbit specialist vet in order to get the correct treatments. Rabbits are prey animals. This means that they are hunted by other animals to be eaten. Foxes, hawks, ferrets, dogs and cats are the predators of a rabbit and will eat them. This is why rabbits do not liked to be picked up and cuddled - they think they are going to be eaten! Children often see rabbits as cuddly and will try and pick them up for a hug resulting in being scratched, kicked or even bitten. A drop from a height or even a serious kick can cause broken bones in your rabbit. So it is best to get to know your rabbit from the floor. Rabbits are naturally shy of everything because they think everything is going to eat them and so it takes a lot of time and patience to earn the friendship of a rabbit - but it is totally worth it! Rabbits are destructive! But it's natural. In the wild, rabbits live under ground in a tunnel system called a warren. So it is natural for your rabbit to dig the carpet or the garden. To prevent this, provide a digging box, a carpet tile or give them plenty of toys to keep busy! Rabbits chew. This is because their 28 teeth are continuously growing and they need to keep them down! Provide your rabbit with plenty of hay and chew toys such as willow to keep them busy - oh and hide those electrical wires as they look like tasty roots to them! Rabbits are clean. But they need you to help them become toilet trained. However the odd little dropping can appear next to the box. If your rabbit is not neutered then you will have to put up with them spraying urine all up the walls..and even on you. A bored rabbit is a destructive rabbit so make sure you keep them busy! On average, owning rabbits costs as much as owning a cat or a dog! Just like our canine and feline companions they need to go to the vets..
Rabbits need a annual vaccination to cover them against two deadly diseases known as VHD and Myxomatosis this costs approximately £30. Rabbits need to be neutered. A male will be castrated and can cost around £50. A female will be spayed and this costs around £100. Not only does it prevent unwanted litters, it can help stop aggressive behaviour, the spraying of urine and cancers in both genders. Rabbits should visit the vets for health checks. 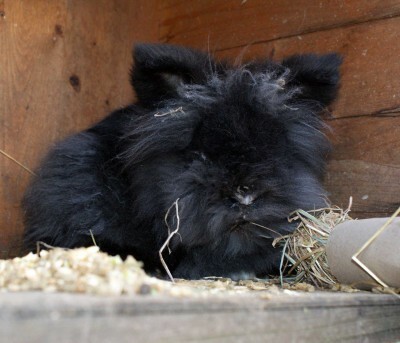 Rabbits will hide their problems and so it can be hard to sometimes spot when a rabbit is ill. The most common problems in rabbits are teeth problems, obesity, breathing problems and parasites such as fleas, ticks and mites. Next is your set up costs - your rabbits are going to need somewhere to live! Consider if your rabbits are going to be indoor rabbits or outdoor rabbits. That will determine what kind of house you are going to buy for them. If you need help with this then here is a website to give you some inspiration as well as tell you the pros and cons. On average a good quality and size hutch will cost around £120 to £350! On average a converted shed can cost around £130 to £250! On average a indoor rabbit cage can cost around £90 - £200! Don't forget your litter trays, water bottles and food bowls! Then your maintenance costs. It is your duty to provide your rabbits with the correct diet and to provide a comfortable and safe place for them to live. Food. Your rabbit will need hay! Not to mention good quality, dust-free hay. A bag of nugget feed and fresh vegetables. Bedding: Something soft to sleep on as well a absorbent to soak in and take away the smell of urine. Toys: Rabbits are intelligent and become bored / destructive when there is nothing to do. Provide them with things to chew, throw, climb in and dig in. And I haven't put you off then great! But remember, please adopt and don't shop! On average 67,000 rabbits go through the doors of a rescue center each year! There are many single males, females and bonded pairs looking for a home today. To find your nearest rabbit rescue please visit www.rabbitrehome.org or consider rescuing a rabbit from us today by clicking here. View more posts in Rabbit Care Information or browse all posts.You can follow this story via its RSS 2.0 feed.